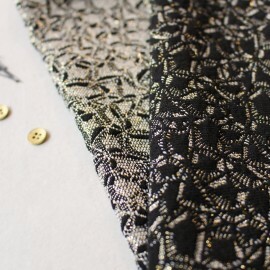 Fall for this Shimmer Chic jacquard fabric by Atelier Brunette. 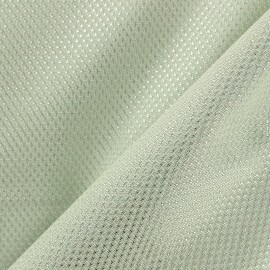 This jacquard fabric is soft and thick, ideal for making jackets, skirts, dresses, and accessories. Made in France and this reversible fabric will bring chic and style to your evening outfits: one black side with lurex details and the other, gold with graphic patterns. 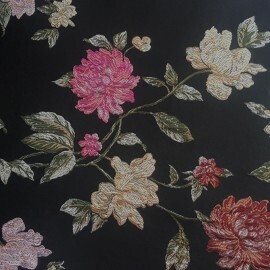 Fall for this black Constance jacquard fabric with pink flower patterns. 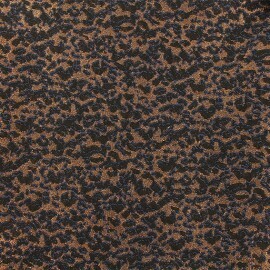 This high quality jacquard fabric is ideal for making skirts or jackets, use its pink reverse for contrasted lapels. You can also use it for your home furnishing and decoration projects. 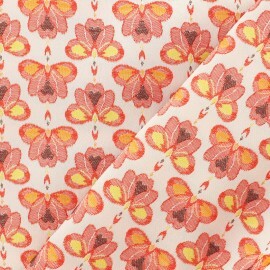 Fall for this pink Lombok jacquard fabric with very pretty graphic patterns and satin finish. This colorful jacquard fabric that will transport you to the warm Indonesian nights, is ideal for making skirts or jackets, use its reverse for contrasted lapels. You can also use it for your home furnishing and decoration projects. Fall for this red Lombok jacquard fabric with very pretty graphic patterns and satin finish. This colorful jacquard fabric that will transport you to the warm Indonesian nights, is ideal for making skirts or jackets, use its reverse for contrasted lapels. You can also use it for your home furnishing and decoration projects. 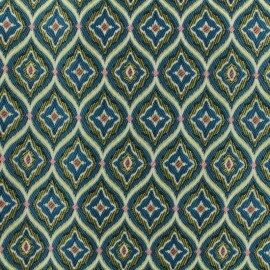 Fall for this blue Lombok jacquard fabric with very pretty graphic patterns and satin finish. This colorful jacquard fabric that will transport you to the warm Indonesian nights, is ideal for making skirts or jackets, use its reverse for contrasted lapels. You can also use it for your home furnishing and decoration projects. 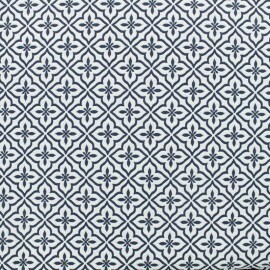 Fall for this Palais jacquard fabric "Made in France", with its beautiful graphic patterns on a blue background. This colorful jacquard fabric is as pretty as the greatest fabrics from Venetian palaces and ideal for making original skirts or jackets. You can also use it for your furnishing and decoration projects. 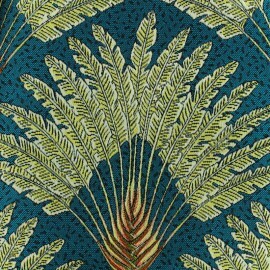 Fall for this Atoll jacquard fabric "Made in France", with its beautiful patterns of "Traveler's Palm trees", an special palm trees variety from the Indian Ocean bordering countries, on a nice peacock blue background. 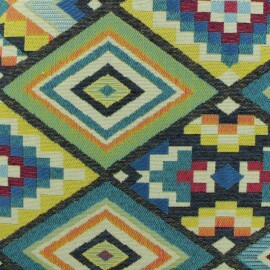 This colorful jacquard fabric is ideal for making original skirts or jackets. You can also use it for your furnishing and decoration projects. 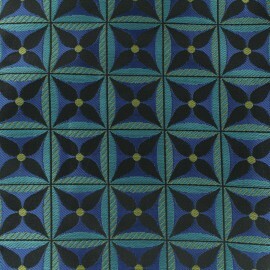 Fall for this Dakota jacquard fabric with very nice graphic patterns on a blue background. 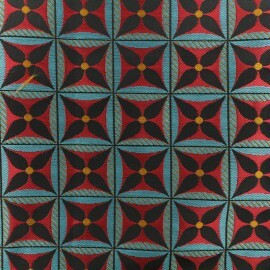 This jacquard fabric, made in France, inspired by Native American design is ideal for making original skirts or jackets. You can also use it for your furnishing and decoration projects. 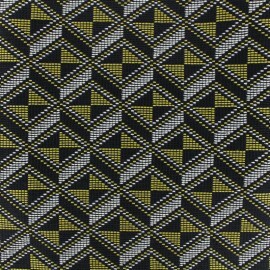 Fall for this Mahjong jacquard fabric with very nice white and yellow graphic patterns on a black background. 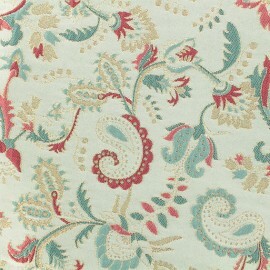 This jacquard fabric, made in France, is ideal for making original skirts or jackets. You can also use it for your furnishing and decoration projects. 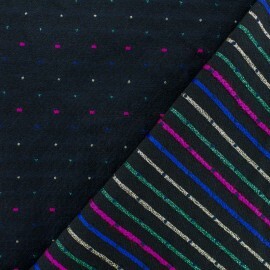 Enjoy this nice Isaac stretch jacquard fabric with black and white graphic pattern with lurex. This jacquard fabric has a good elasticity and is ideal for making jackets or skirts but also for your decoration projects. 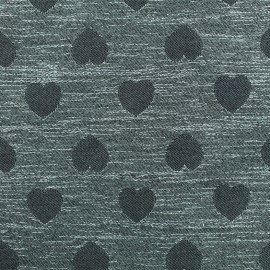 Fall for this lurex jacquard fabric with hearts and background with grey tones and lurex details.This jacquard fabric is ideal for making skirts or jackets. You can also use it for your home furnishing and decoration projects. 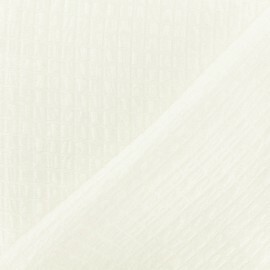 Discover this beautiful Archi jacquard fabric composed of 55% Viscose. 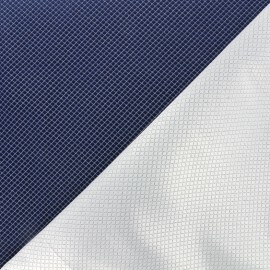 With its beautiful fluidity and beautiful graphic relief, this fabric is ideal for making elegant and timeless clothes. Wear a beautiful jacquard jacket with a pair of jeans or make a chic and timeless dress. With this pretty Ankara quilted jacquard fabric with black and white graphic design, make wonderful skirts or jackets. You can also use it for your accessories and decoration projects. A revisited basic with a touch of modernity thanks to its small graphic patterns. 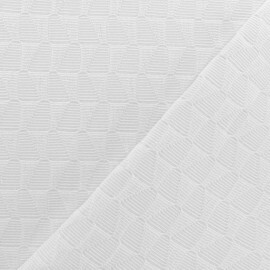 With this pretty Izmir quilted jacquard fabric with black and white graphic design, make wonderful skirts or jackets. You can also use it for your accessories and decoration projects. A revisited basic with a touch of modernity thanks to its small graphic patterns. 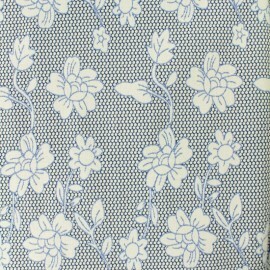 Fall for this white Osaka jacquard fabric with a modern and graphic pattern. With its light relief and this wide width, this jacquard fabric is ideal for your boutis and bed covers and for your home furnishing and decoration projects. 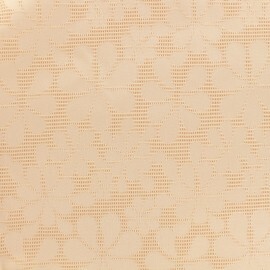 Fall for this Galatée jacquard fabric with square relief and pretty pearly white color. 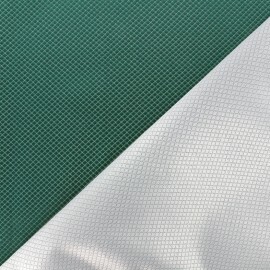 This Oeko-Tex certified jacquard fabric is light and ideal for making skirts or jackets. You can also use it for your home furnishing and decoration projects. Fall for this Elisabeth jacquard fabric with large peonies and an off-white background with a majestic black foliage and lurex details. 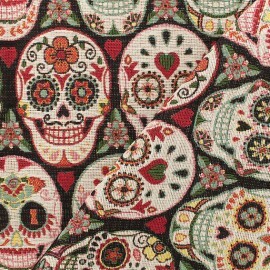 This Oeko-Tex certified jacquard fabric is ideal for making skirts or jackets. You can also use it for your home furnishing and decoration projects. 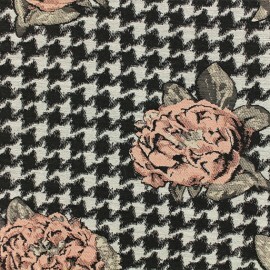 Fall for this Salma jacquard fabric with houndstooth pattern with pink roses. 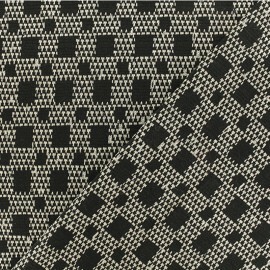 This black and white jacquard fabric is ideal for making skirts or jackets. You can also use it for your home furnishing and decoration projects. 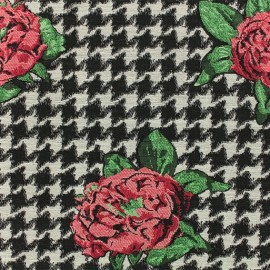 Fall for this Salma jacquard fabric with houndstooth pattern with red roses. 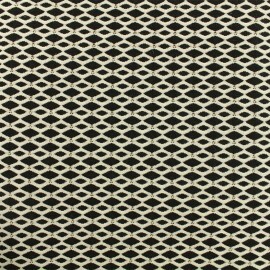 This black and white jacquard fabric is ideal for making skirts or jackets. You can also use it for your home furnishing and decoration projects. 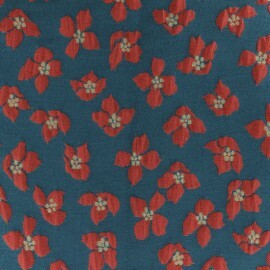 Fall for this Maddie jacquard fabric with embossed poppy flowers and lurex details. 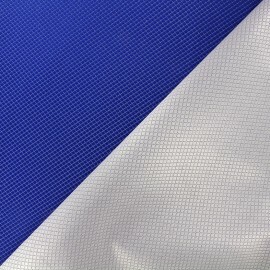 This Oeko-Tex certified blue jacquard fabric is ideal for making skirts or jackets, use its red reverse for contrasted lapels. You can also use it for your home furnishing and decoration projects. 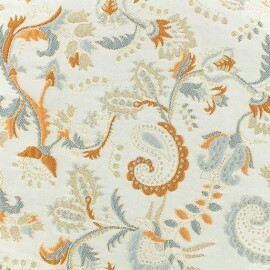 Fall for this light blue and rust Esmé jacquard fabric with embossed gypsy patterns and gold lurex. 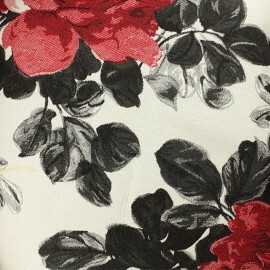 This jacquard fabric is ideal for making skirts or jackets, use its raspberry pink reverse for contrasted lapels. You can also use it for your home furnishing and decoration projects. Fall for this light blue and pink Esmé jacquard fabric with embossed gypsy patterns and gold lurex. 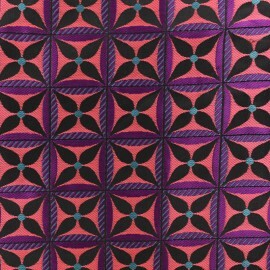 This jacquard fabric is ideal for making skirts or jackets, use its raspberry pink reverse for contrasted lapels. You can also use it for your home furnishing and decoration projects. 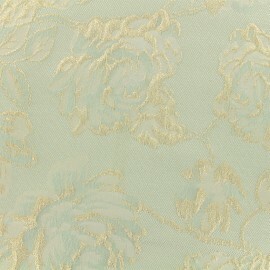 Fall for this light blue Olympe jacquard fabric with embossed roses and gold lurex. 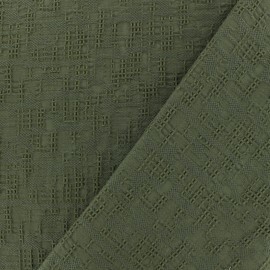 This Oeko-Tex certified jacquard fabric is ideal for making skirts or jackets, use its reverse for contrasted lapels. You can also use it for your home furnishing and decoration projects. 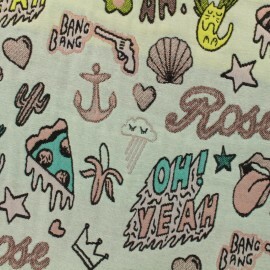 Fall for this light pink Olympe jacquard fabric with embossed roses and golf lurex. 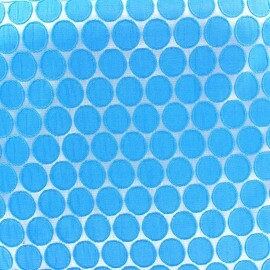 This Oeko-Tex certified jacquard fabric is ideal for making skirts or jackets, use its reverse for contrasted lapels. You can also use it for your home furnishing and decoration projects. 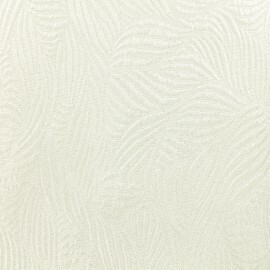 Fall for this white Marta jacquard fabric with embossed leaves and silver lurex. 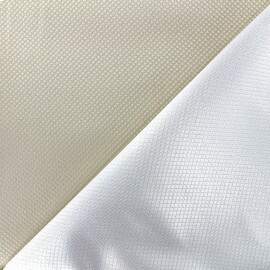 This Oeko-Tex certified cream jacquard fabric is ideal for making skirts or jackets, use its reverse for contrasted lapels. You can also use it for your home furnishing and decoration projects. 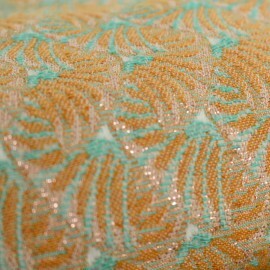 Fall for this Marta jacquard fabric with embossed leaves and lurex. 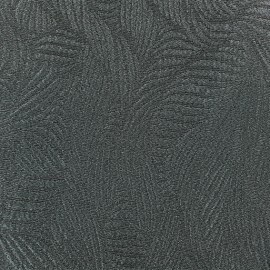 This Oeko-Tex certified navy blue jacquard fabric is ideal for making skirts or jackets, use its black reverse for contrasted lapels. You can also use it for your home furnishing and decoration projects. 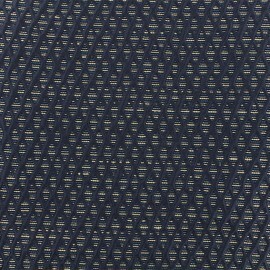 Fall in love with this Octavia graphic jacquard fabric with embossed diamonds and very fine lurex stripes. 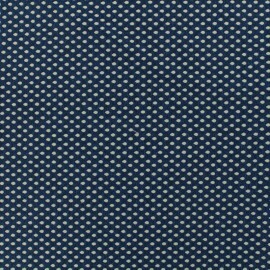 This navy blue jacquard fabric is Oeko-Tex certified and is ideal for making skirts or jackets, use its reverse for contrasted lapels. You can also use it for your home furnishing and decoration projects. 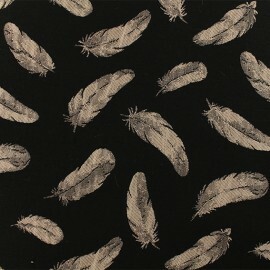 Enjoy this nice Gustave stretch jacquard fabric with black graphic pattern on a white background with small lurex dots. 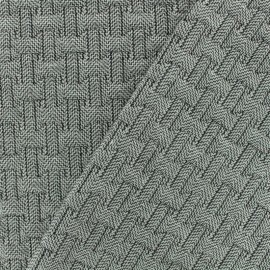 This jacquard fabric has a good elasticity and is ideal for making jackets or skirts but also for your decoration projects. 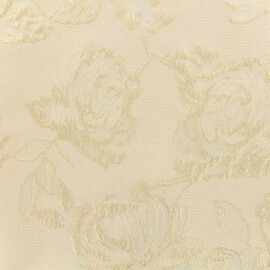 Enjoy this nice Odette jacquard fabric with flowers on a lurex beige background. 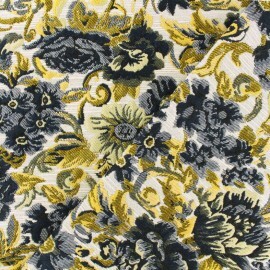 With its beautiful yellow and navy blue flowers, this jacquard fabric is ideal for making jackets or skirts but also for your decoration projects. 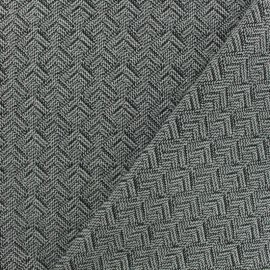 Very nice jacquard knitted fabric very comfortable, simple and elegant with a wonderful pattern! 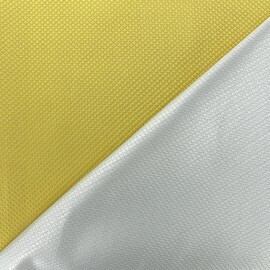 Beautiful reversible fabric, perfect to create bright and sophisticated clothes.